Can Quick-Step Laminate be installed around my stove? Yes, it can. However, you should consider a number of things. your floor from any damage. your laminate floor stays brand new. *These precautionary measures also apply to other heavy pieces of furniture, such as aquariums. surface structure is perfectly in harmony with the design. highly sophisticated printing techniques and finished with melamine resin. tile imitation look extremely real and natural. characteristics. It's extremely durable, stable and highly moisture resistant. that will not cup or bow when properly installed and maintained. be used in all other rooms in your house. recommended to remove any standing moisture as soon as reasonably possible. frequently and more intensively than in some other rooms of your house. Quick-Step cleaning product in the cleaning water. Are Quick-Step Laminate floors sensitive to static electricity? Every Quick-Step floor receives a unique, permanent antistatic treatment. conditions. 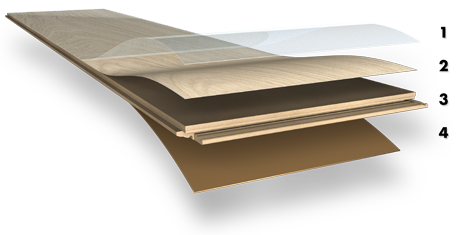 It makes Quick-Step floors ideal for offices, stores, etc. due to exposure of sunlight is not to be expected. staircase must be straight and not rounded. Glue a cut to size laminate panel with Quick-Step One4All glue to the riser. against the edge of the front of the alu base. Can I use Quick-Step Laminate in combination with underfloor heating? you install your floor 'floating' and that you choose the right underlay. the moisture barrier (this is not possible with full-surface gluing). cooling and ask you dealer for instructions. Can Quick-Step Laminate be installed on top of an existing floor covering? wish to install your new floor on the ground floor level or on an upper level. must be sufficient ventilation in the crawl space underneath the timber floor. also considerably increase the sitting comfort. Additionally, you can put a transparent protective mat under your office chairs. combination of soft castors and a protective mat is strongly advised.